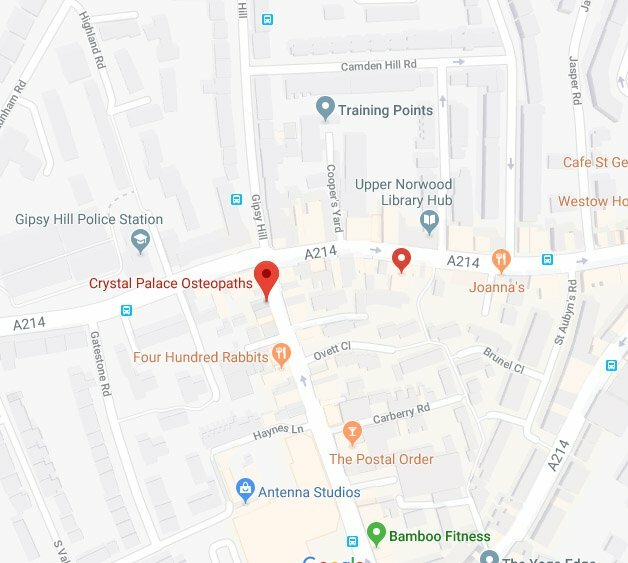 Crystal Palace Osteopathic Practice has been serving the local community in Upper Norwood for 30 years. 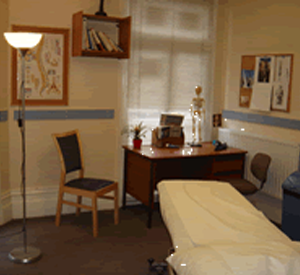 We offer a professional service in a bright clean environment with friendly staff. We have a good selection of magazines and children’s toys in the waiting room. We have an ethos of environmental awareness, and use environmentally friendly office and cleaning products. All our paper is recycled. We use fair trade products for our staff beverages. We are interested in an holistic approach to health care and offer a range of products to support your needs, from biofreeze pain and natural anti-inflammatory gel to natural skin products. To assist your own healing process, you may be given advice regarding exercises, posture and nutrition relevant to your condition. It’s easy to locate us. 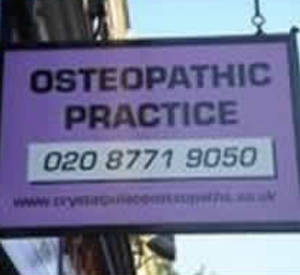 We have a projecting lilac wall sign ‘Osteopathic Practice’ about 10 metres from the traffic lights at the junction of Gipsy Hill plus a matching free standing sign sitting on the pavement directly outside the front door. There is a one-way traffic system around the Crystal Palace triangle. Although there is side street parking, the best place to park is the free outdoor public car park behind Sainsbury’s supermarket or the indoor car park, which is free for 2 hours. This is entered via a left turn off Westow Street, after the junction from Church Road, into Cox Road towards the Secret Garden Centre. 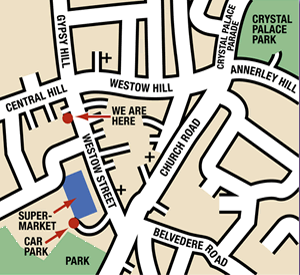 From the supermarket, walk along Westow Street towards the traffic lights at Gipsy Hill. We are on the same side of the street so there is no need to cross over the road. Saturday afternoon, Sundays, and evening appointments are available for Deep Tissue Massage. Please phone for an appointment before coming along.